How does a wood gasification boiler work ? 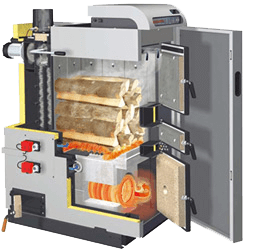 Wood gasification boilers typically burn wood in an upper (primary) combustion/wood storage area. This combustion zone is relatively low in temperature and is quite large. The primary combustion chamber is generally supplied by air at the base of the base of the primary combustion chamber. Below the primary combustion chamber there is a secondary combustion zone generally consisting of a ceramic refractory chamber with injected combustion air. The secondary chamber is designed for high turbulence, high temperature and high residence time of the combustible gasses. A lambda control system automatically adjusts primary and secondary combustion air through independent air controls, optimizing combustion as the wood burns. The lambda control system monitors excess oxygen and the temperature of the exhaust, feeds this information to the processor, and adjusts air damper servo motors appropriately. Combustion air is adjusted to automatically match the composition of the wood fuel at any stage of combustion, and for any variation in the wood fuel. Harmful emissions are reduced and efficiency increases.